Free Music: ‘No Capes’ from Guante + Big Cats! ‘A Hug from a Stranger’ (Video) – Guante + Big Cats! Where can you see Twin Cities storyteller Amy Salloway share the stage with Julliard-trained powerhouse playwright/actress Stacey Karen Robinson from the Bronx? Or folksoul singer Gina Breedlove, who has worked with Ani DiFranco, Toshi Reagon, and on Broadway in The Lion King, in the same evening as local dancer/choreographer Julie Warder, authors from the Givens Black Writers Collaborative, and “sound composer” Mankwe Ndosi? At the Non English Speaking Spoken Here: The Late Nite Series, curators e.g. bailey and Laurie Carlos enter their 13th year bringing some of America’s most dynamic interdisciplinary performers together to explore the cross-currents of contemporary culture through music and sound, text and images, and movement and dance. 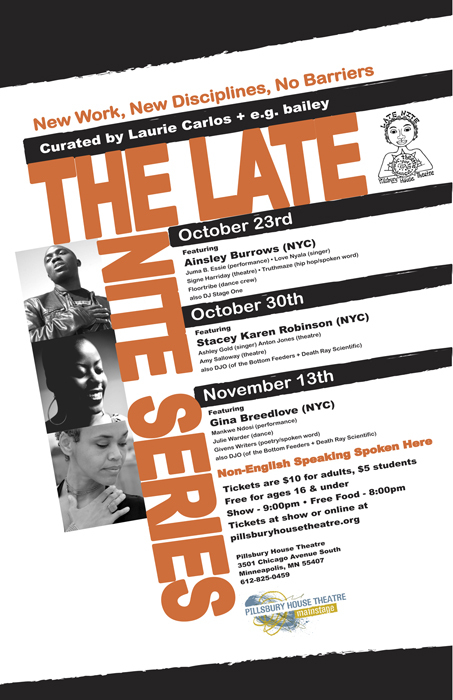 Pillsbury House Theatre presents Non English Speaking Spoken Here: The Late Nite Series on Saturdays, October 23, October 30, and November 13. When you attend a Late Nite performance, you’re part of a family and every good family has a good meal. That’s why we always serve up great food before you digest some amazing art. Be sure to bring your appetite when you join us for Late Nite. Food from local chefs served at no extra charge starting at 8 pm in the lobby where audiences can mingle with artists before the show. The show starts at 9 pm. FREE for anyone under 16. Using language like John Coltrane used the tenor or soprano saxophone, Bailey — together with friends such as Aimee Bryant, Katrah Quey, Sha Cage, Hipgrosis, D.J.Limbs, plus African poets Ibe Kaba and Sankaradjeki; Dubai jazz ensemble Abstract Collision, and Mankwe Mdosi, the singer from Atmosphere — uses bits of pre-recorded sound, field recordings (including Liberian work songs from the Mano Tribe) and jazz. He rails, he whispers, he implores, he exhorts and subtly weaves his spell. This weekend, E.G. Bailey is going to drop a bomb — a “proverbial bomb” that is! On Saturday, the Bedlam Theatre hosts the release show for Bailey’s debut album, titled AMERICAN AFRIKAN, showcasing his creative mix of powerful spoken word, performance art and hip-hop/funk/jazz/electronic music. Additionally, the night will feature the work of many more artists and musicians like Guante, Mankwe Ndosi, Truthmaze, Chantz Erolin, Aimee Bryant, Ibé Kaba, Sankaradjeki, Dameun Strange, Kahll Brewington, DJ Stage One and more. Originally posted on l’étoile magazine on 18 February 2010. Spoken-word artist and Tru Ruts label proprietor E.G. 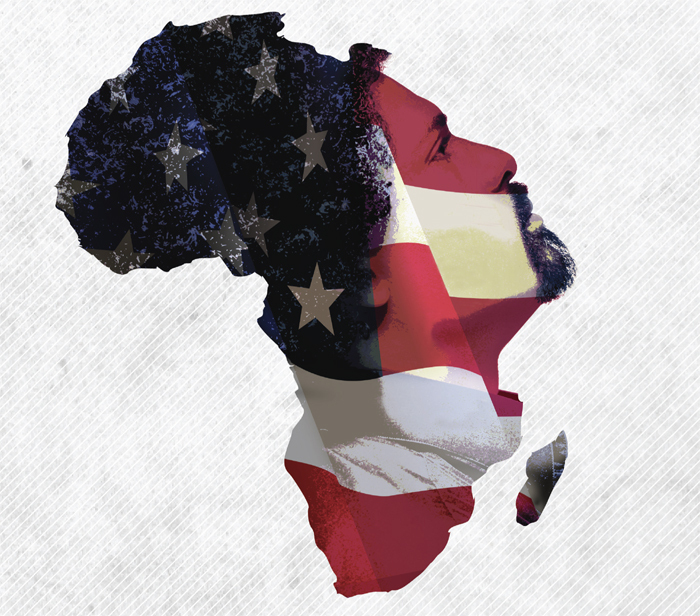 Bailey might have what you’re looking for in the form of his first full-length CD, “American Afrikan”. Inspired by Bailey’s trips to Africa, the disc laces field recordings and traditional African verses with modern digital beats and live drums. In “Liberia,” for instance, he expounds on a “nation waiting to be reborn” over the rhythmic clanging of hammers from field workers. In the title track, he trades verses with African poets over a steady treadmill-like beat and soulful backup vocals by Atmosphere touring member Mankwe Ndosi. Themes of identity, reclamation and rebirth permeate the album and should make for an equally evocative stage show. The release party is Saturday at the West Bank’s Bedlam Theatre with guests Guante, Sha Cage and more (9:30 p.m., $5). ‘American Afrikan’ is not just a CD release party, but also a musical celebration of Black History that brings together some of the leading African and African American performers in the Twin Cities. Spoken Word innovator E.G. Bailey’s CD is a musical exploration of language and blows out of the water traditional concepts of old school ‘spoken word’ featuring M.anifest, Truthmaze, Members of Junkyard Empire, Sha Cage, Guante, Mankwe Ndosi, J. Otis Powell!, Chantz, See More Perspective, Dameun Strange, Andy Shafer, and more. When: February 20 : 10 p.m.
e.g. bailey’s debut mixes poetry, jazz, electronica, hip hop + more. Hosted by J. Otis Powell!. Featuring Guante, Mankwe Ndosi, Truthmaze, Sha Cage, See More Perspective, Chantz Erolin, Aimee Bryant, Ibé Kaba, Sankaradjeki, Dameun Strange, members of Junkyard Empire (Chris Cox + Bryan Berry), Kahlil Brewington, DJ Stage One + more. “This is a year of completion for me,” e.g. bailey says in the office of Trú Rúts Endeavors, the multidisciplinary arts organization that he runs with his wife, Shá Cage. His struggle to fit in America is not unlike that of many African immigrants. He attributes his success as an award-winning multidisciplinary artist and producer to this struggle of finding a home away from home. bailey, who was born in Saclepea, Liberia, is the son of a white Peace Corps volunteer and a Liberian mother. His father, bailey says, “threw a dart, hit Liberia, and that’s where he got stationed.” His mother gave birth to him near the end of his father’s second term; and his parents lost touch after his father’s return to America. Even as a child he loved music and theater: two memories stand out in particular from his life in Liberia. One day, another Peace Corps volunteer came to his village and, after getting to know him, expressed interest in adopting him. Instead it was his father who ended up adopting the 10-year-old Bailey after she sought out his father through the Peace Corps database. After landing in Chicago, he was driven to his new home in Crystal Lake, an hour-and-a-half from Chicago. There was a parade the day he arrived, with money thrown from the floats. After moving to Minneapolis, he started performing solo and with a number of music groups, and worked in the retail division of Prince’s famed Paisley Park complex, gaining crucial experience to navigate the shady mazes of the music industry when he formed Trú Rúts and its record label, Speakeasy Records. He had a life-changing experience on a trip to the country of his birth after being gone for nearly 20 years. He returned to Liberia in 1999 as part of a four-month trip to Africa, the Middle East and East Asia. The trip, while crucial to his development as an artist as well as a person, was not what he expected. Thus homelessness and travel inform all of bailey’s work, which symbolically channels his own experience through the larger histories of the African Diaspora. His album American African, scheduled for release in April, will appropriately feature a host of both American Africans and African Americans, including M.anifest, DJ Stage One, Mankwe Ndosi, IBé, and other international artists, including Germany’s Starsky and Dubai’s Abstract Collision. The first single off of American African, “America,” is a wide-ranging vision of the post-9/11 America that many immigrants find themselves in. bailey has an ambitious plan to release three more albums in 2009 that have been at various stages of completion throughout his work with Trú Rúts. Yet completion always breeds the start of something new, whether it be the release of new albums from other artists in the Tfamily such as Quilombolas, TruthMaze, or El Guante. Or the birth of his first child with his wife Shá Cage. Even though e.g. bailey has settled in one place after a long journey, his creative activity and poetic journeys show no signs of slowing down. e.g bailey has produced “No Longer at Ease” (play), an adaption from the Chinua Achebe’s novel for the Pangea World Theatre in May 2001; “Village Blues” (film); and “Words Will Heal the Wound”, a spoken word radio series celebrating the diverse poetic traditions in Minnesota. He received the Sarah Lawrence College International Film Festival (2001) Experimental Film award for Village Blues; the NFCB (National Federation of Community Broadcasters) award for Write On RaDio! ; and the Worldstaff Houston International Festival (1999) Experimental Film award for Village Blues. Visit his website for a full listing of productions, performances and awards: www.myspace.com/egbailey or www.egbailey.com.